Dental pulp stem cells derived (DPSCs) represents a new and exciting alternative source of adult stem cells for use in regenerative medicine. The DPSCs are considered very unique because the cells are relatively easy acquire in an extremely safe and low invasive procedures. During our early development, dental pulp is the main source of nutrition of our jaw,brain and developing teeth due to them containing potent quantities of mesenchymal stem cells. 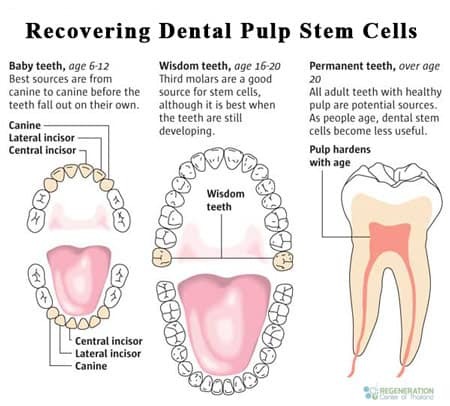 DPSCs are a variant of adult stem cells and are typically found in baby wisdom and are usually discarded when the teeth fall out naturally. What Can DPSC’s be used for? 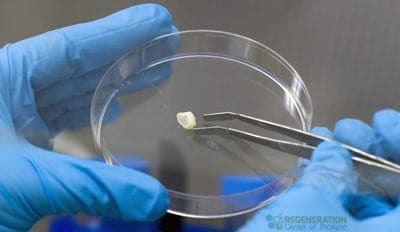 When a child’s deciduous teeth (wisdom teeth) come out naturally (ages of 6 and 12) They can be temporarily placed in a sealed container of milk and shipped to our stem cell lab in Bangkok. For optimal results, the fallen teeth should be less than 3 days old. Once our lab has received the package, dental pulp stem cells are isolated, cleaned,processed and cryogenically preserve the stem cells for up to 20 years. The cells can then be used for the child donor or other family members to treat future health conditions. The Regeneration Center of Thailand and BioEden Labs have developed the unique technology and expertise to preserve your children’s dental pulp cells ready for use in case they are ever needed. All these properties and findings show that dental pulp stem cells offer tremendous utility for regenerative cellular therapies for both neurodegenerative diseases and traumatic injuries such as those to our central nervous system along with spinal cord injuries. To learn more about regenerative medical therapies using dental pulp stem cells please contact us today.